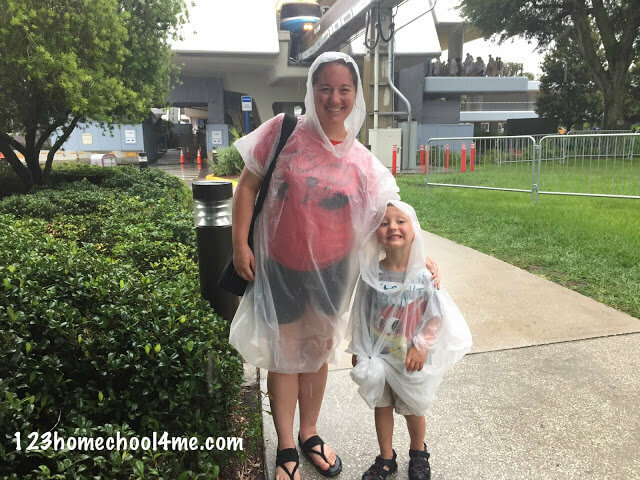 Be prepared for the daily rainstorm you are likely to encounter on your next Disney World vacation with these fantastic Tips for Doing Disney World in the Rain! Wondering what you should do af and when the rains starts coming down during your trip? These are our top 8 tips for doing Disney in the rain. When the rain starts pouring and the thunder gets rumbling, you will likely notice a large number of people vacating the parks. We do not recommend joining them. Generally speaking, the rain will pass quickly, and those who stick around will be left with a relatively empty park to enjoy. Instead of leaving at the first sign of water, pack a poncho and some water shoes, put your valuables in zipper baggies, and get ready to have some fun in the rain. ● Splash Mountain (Magic Kingdom) — There is a small, toddler-sized play area located under the railroad bridge near Splash Mountain. to play without riding, making this a great rainy weather spot. Unfortunately, the ride will close if there is lightning involved, and in this case, the queue may close also. ● Mission: Space (Epcot) — If you go in the exit of the Mission: Space ride, you will find a small, carpeted play area for kids. This area includes a space-themed climbing structure that little ones go crazy for. ● The Seas with Nemo and Friends (Epcot) — Another Epcot play area is located in The Seas with Nemo and Friends building. This area is shark-themed and includes plenty of fun games. There is nothing quite like a warm latte and some good, old-fashioned people-watching on a rainy day. If your Disney afternoon is filled with water, why not use the storm to catch a bit of relaxation? Grab a coffee from Starbucks, find a covered place to sit, and enjoy some quality people-watching while listening to the rain. Many Disney World rides see some very long lines. Generally speaking, it can feel like a waste of time to wait in one of these insanely long queues. However, if you are simply looking for a way to get out of the rain, it is actually pretty smart to hop in an indoor queue and wait out the storm while also getting a bit closer to riding one of your must-see attractions. Some of our favorite indoor queues include Space Mountain, Pirates of the Caribbean, Philharmagic, and Buzz Lightyear Space Ranger Spin in Magic Kingdom, as well as Toy Story Midway Mania and Star Tours in Hollywood Studios, Dinosaur in Animal Kingdom, and Soarin’ Around the World and Frozen Ever After in Epcot. Looking for more indoor fun? 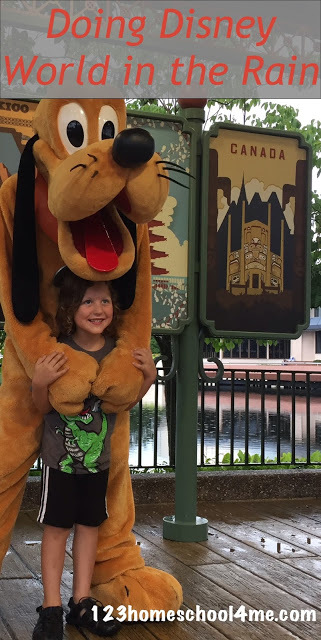 Consider finding some character meet-and-greets. There are several places where you can meet favorite Disney friends inside, meaning rain is not a hindrance at all. 1. Epcot Character Spot (Epcot) — Meet Mickey, Minnie, and Goofy, then head across the covered breezeway to meet another set of characters from recent films. 2. Lamps of Wonder (Epcot) — Found tucked away in the Morocco Pavilion, Lamps of Wonder is the place to go to meet Aladdin and Jasmine inside and out of the rain. 3. Royal Sommerhaus (Epcot) — Anna and Elsa stay nice and dry in their sommerhaus. Why not join them for a quick chat and a snapshot? around and meet two different princess as long as you’re willing to wait in line. 6. Pete’s Silly Sideshow (Magic Kingdom) — Minnie, Donald, Daisy, and Goofy can all be found under the Big Top in Storybook Circus in New Fantasyland. 7. Woody’s Picture Shootin’ Corral (Hollywood Studios) — Head into Andy’s room, get nice and dry, and meet everyone’s favorite toys, Buzz and Woody. 8. Star Wars Launch Bay (Hollywood Studios) — Star Wars fans will love the Star Wars Launch bay where they can meet a few of their favorite Star Wars characters. at this indoor character meeting location. Mickey and Minnie are all decked out in their safari gear at this fun indoormeet-and-greet. I love food, and in my opinion, eating some good food in a well-themed restaurant is a wonderful way to pass the time during a rainstorm. Fortunately, Disney World has plenty of great eateries to choose from. I especially enjoy spending some time listening to the out-of-this-world music played by a friendly alien at Cosmic Ray’s Starlight Cafe or enjoying a warm bowl of soup upstairs at Columbia Harbor House in Magic Kingdom. 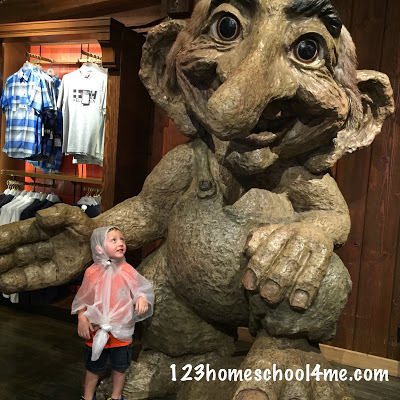 Indoor museums and interactive exhibits are the perfect way to have a blast despite some rainy weather. Additionally, buildings that house multiple attractions can be the perfect solution for those who wish to stay dry. There are a good number of buildings dedicated to just these kinds of things all over Epcot, and one in Hollywood Studios. or movie preview of some sort, as well as a character meet-and-greet. ● Mission: Space Exit (Epcot) — If you have small kids, Mission: Space may not be a ride option for your family. However, the area located at the exit of the ride is both indoors and incredibly entertaining. As mentioned before, it includes a playground, but there are also a number of other space-themed activities available. ● Spaceship Earth Exit (Epcot) — This ride exit also has a large indoor space filled with activities. All kinds of video games are sure to keep the attention of your group for a while. and Friends ride, and the shark play area mentioned before, making it a great place to spend a couple of hours during a storm. ● The Land (Epcot) — While there are no activities, exhibits, or games in this building, there are three different attractions as well as two restaurants. Circle of Life, Soarin’ Around the World, and Living With the Land all call this pavilion home. Additionally, Sunshine Seasons and Garden Grill are both serving up delicious food under the same roof. This is not a bad place to be trapped while the rain comes down. ● Innoventions (Epcot) — A tiny science museum inside of Epcot, Innoventions is a great place to pass some time. The exhibits change from time to time, meaning it is worth visiting on more than one trip.